Asymmetry in Early Universe : What Happened Before the Big Bang ? 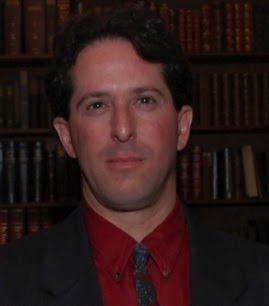 In a paper published in December 16 issue of the journal Physical Review D, a team of physicists from California Institute of Technology has shed new light on the nature of asymmetry in Early Universe and the question of what came before the big bang. "It's no longer completely crazy to ask what happened before the Big Bang," comments Prof. Marc Kamionkowski, who with graduate student Adrienne Erickcek and senior research associate in physics Sean Carroll, proposed a mathematical model explaining an anomaly in what is supposed to be a universe of uniformly distributed radiation and matter. Their investigations turn on the inflationary scenerio of the early universe, first proposed in 1980, which posits that space expanded exponentially in the instant following the Big Bang. "Inflation starts the universe with a blank slate," Adrienne Erickcek describes. The hiccup in inflation, however, is that the universe is not as uniform as the simplest form of the theory predicts it to be. Some parts of it are more intensely varied than others. Until recently, measurements of the Cosmic Microwave Background (CMB) radiation, a form of electromagnetic radiation that permeated the universe 400,000 years after the Big Bang, were consistent with inflation--miniscule fluctuations in the CMB seemed to be the same everywhere. But a few years ago, some researchers, including a group led by Krzysztof Gorski of NASA's Jet Propulsion Laboratory, which is managed by Caltech, scrutinized data from NASA's Wilkinson Microwave Anisotropy Probe (WMAP). They discovered that the amplitude of fluctuations in the CMB is not the same in all directions. "If your eyes measured radio frequency, you'd see the entire sky glowing. This is what WMAP sees," Kamionkowksi describes. 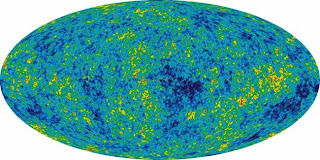 WMAP depicts the CMB as an afterglow of light from shortly after the Big Bang that has decayed to microwave radiation as the universe expanded over the past 13.7 billion years. The probe also reveals more pronounced mottling--deviations from the average value--in the CMB in one half of the sky than the other. "It's a certified anomaly," Kamionkowski remarks. "But since inflation seems to do so well with everything else, it seems premature to discard the theory." Instead, the team worked with the theory in their math addressing the asymmetry. They started by testing whether the value of a single energy field thought to have driven inflation, called the inflaton, was different on one side of the universe than the other. It didn't work--they found that if they changed the mean value of the inflaton, then the mean temperature and amplitude of energy variations in space also changed. So they explored a second energy field, called the curvaton, which had been previously proposed to give rise to the fluctuations observed in the CMB. They introduced a perturbation to the curvaton field that turns out to affect only how temperature varies from point to point through space, while preserving its average value. The new model predicts more cold than hot spots in the CMB, Kamionkowski says. Erickcek adds that this prediction will be tested by the Planck satellite, an international mission led by the European Space Agency with significant contributions from NASA, scheduled to launch in April 2009. For Erickcek, the team's findings hold the key to understanding more about inflation. "Inflation is a description of how the universe expanded," she adds. "Its predictions have been verified, but what drove it and how long did it last? This is a way to look at what happened during inflation, which has a lot of blanks waiting to be filled in." But the perturbation that the researchers introduced may also offer the first glimpse at what came before the Big Bang, because it could be an imprint inherited from the time before inflation. "All of that stuff is hidden by a veil, observationally," Kamionkowski says. "If our model holds up, we may have a chance to see beyond this veil." "A hemispherical power asymmetry from inflation"